Marketing Derby Welcome Pack Arrives! Generally speaking I’m always excited by receiving post (simply because it becomes rarer and rarer as technology marches on). Even invoices and bills don’t tend to come through the post any more. 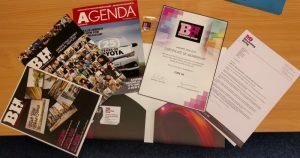 Anyway, since winning the Rising Star Award a few weeks ago, I’ve been more keen than ever to keep checking the post box…and today our welcome pack arrived! We’ve got the certificate up and on the wall, and I’ve got the upcoming events pencilled in my calendar already (I like to think I have my priorities in order). I’m looking forward to the various events, and the things I’ll be learning about from the different Bondholders over the coming months. https://www.code56.co.uk/wp-content/uploads/2016/09/code-56-colour-logo-315-156.png 0 0 Owen Conti https://www.code56.co.uk/wp-content/uploads/2016/09/code-56-colour-logo-315-156.png Owen Conti2018-03-12 09:00:252018-06-25 16:50:21Marketing Derby Welcome Pack Arrives! Why awards can help you win big Page 56!